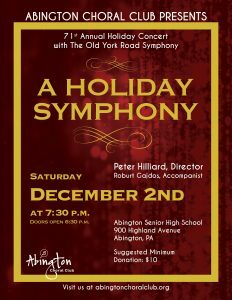 We are thrilled to have the Old York Road Symphony join Abington Choral Club to create A Holiday Symphony on Saturday, December 2nd at 7:30 PM. This concert will delight and entertain with a mixture of holiday classics — some with a twist. The concert will feature two new arrangements by Director, Peter Hilliard: A stirring rendition of I Heard the Bells on Christmas Day and a beautiful version of Raisins and Almonds, a Yiddish lullaby. Join us! Sing along with us! Bring friends and family, children and grandchildren. All are sure to to enjoy this festive and entertaining evening! This entry was posted in Uncategorized by accwebmaster2. Bookmark the permalink.